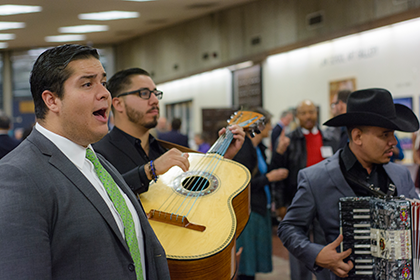 Hundreds of UNM Law School faculty, alumni, friends, students and staff participated in a New Mexican Holiday Fiesta at the law school on Wednesday, December 9. The law school’s third annual holiday gathering was a big success. It was the first time the gathering was held in the forum, the back patio and a few of the classrooms as well as the Leo M. Romero Courtroom. The ample space provided room to move around, socialize, and enjoy the festivities. Attendees enjoyed live music from Law School alums Darren & Dynette Cordova, staff member Jayson Capps, Professor Alex Ritchie, Professor Aliza Organick and Dean Sergio Pareja. A video retrospective showed the law school through the years. The back patio lounge provided a festive environment, with twinkling lights, red chile hot cocoa and heaters. Attendees agreed – this was a holiday party not to be missed! Darren Cordova (’12) serenades the audience with his fellow musicians. 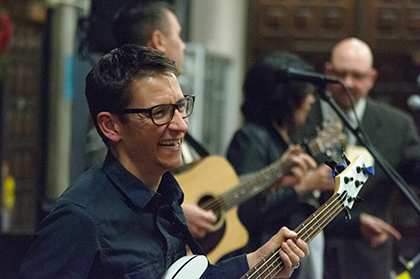 Web administrator Jayson Capps, right, enjoys a laugh while playing his bass. 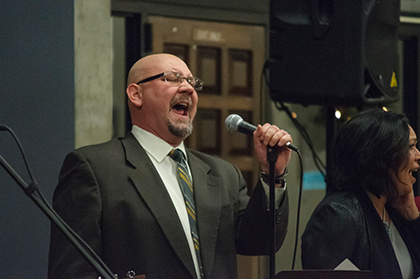 Professor Alex Ritchie and Professor Aliza Organick belt out a tune. 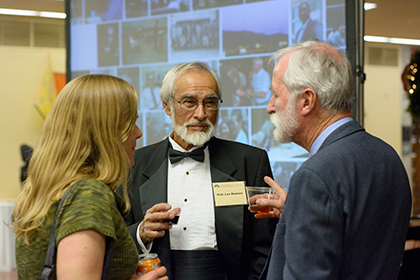 Dean Emeritus Leo Romero (center) chats with Sally Paez (’09) and Justice Charlie Daniels (’69). Complimentary New Mexico foods and local beer and wine were served. The back patio provided a festive environment to relax with friends.